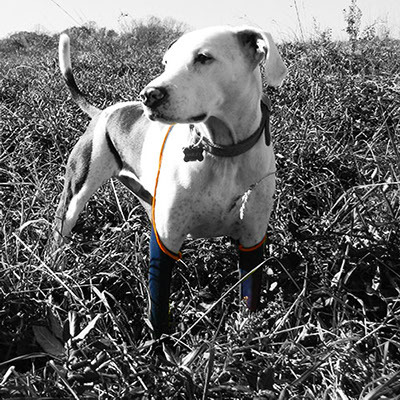 You may have seen leg warmers for dogs, but these H-Leggings are leg protectors for dogs... and in their sporty royal blue and orange strap, they look pretty chic too! These striking patented leggings are made of a special stretch fabric that fit over your dog's front legs and are held secure by an extended band of fabric that fits around her upper back. They are intended to keep your dog from biting on her legs, whether she has just had surgery, has allergies, hot spots, or insect bites that seem to call to her for intervention. They sure beat having to wear a cone - although some dogs are persistent enough to require both H-Leggings and a cone! The H-Leggings' namesake, Harley, is the mixed breed German Shorthaired Pointer modeling the leggings above, and he is the inspiration for the H-Leggings and other products developed by H4Legs Pet Products. For more information and to order the H-Leggings visit H4Legs.com. 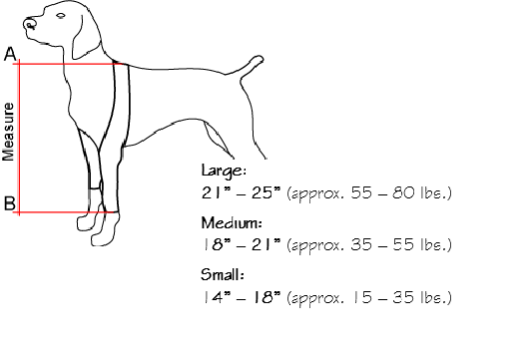 For dog breeds that typically fit into each size, click here.